For Women’s History Month, CUESA is spotlighting women who are transforming our food system. According to the latest Census of Agriculture, nearly one million women work in the fields in the United States, almost one-third of our country’s farmers. This week we talk with a few of the hardworking and successful women farmers of the Ferry Plaza Farmers Market to hear about what brought them to farming and what drives them in their work. Find more stories at hashtag #womeninag. 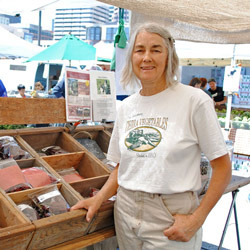 At 34 years old, Moira Firmin is one of the younger farmers at the Ferry Plaza Farmers Market. 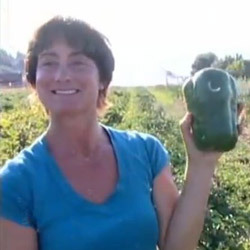 She farms at Marin Roots Farm on 35 acres of leased land in Petaluma, with her husband, Jesse Kuhn. They grow a wide variety of organic vegetables and microgreens, with a strong restaurant clientele. How did you get started farming? In my youth, I spent my summers on a small organic farm up in Nevada City. Around five years ago, I got started farming with County Line Harvest when I met farmer Dave Retzky and he offered me a great opportunity to work on his farm. As positions continued to open on the farm, I kept stepping up to fill them to the point that I was managing the farm and sales. I got a comprehensive look at organic farming on a larger-scale small farm, and I jam-packed a lot of learning. That’s what got me really into farming. In June 2014, I joined my husband, Jesse, and we started farming together at his farm. What do you love about farming? I love the challenge, and I love that farming is all-consuming. It’s your entire life. The food world seems to attract a certain caliber of people who have a sense of community, who have a passion for what they’re doing, and who are willing to work really hard. I love working directly with chefs. They continue to challenge me every day on what varieties to grow and on quality. They’ve pushed me to grow new things that I’ve never thought to grow before. What advice do you have for new farmers? There are many opportunities for farming, but they may not look like what you expect. The old picture of farmers was that you owned land. Nowadays we see more farmers who don’t own land, such as Jesse and myself. We will always lease our farmland. We would love to own land, but being in West Marin, where flatlands and water are scarce, I don’t foresee being able to purchase land that’s affordable to us. Since we lease, we have to be creative about putting in structures. I would say, be flexible with your dream and don’t give up. If you love farming and you’re willing to push yourself hard, you will find your way. Lee James started farming in 1980 with her brother, Wayne, at Tierra Vegetables in Sonoma County. The farm has made its reputation with a wide variety of vegetables, heirloom beans, and unusual chile varieties, as well as hot sauces and other products made by Lee and her kitchen staff. How did you get started farming? My parents were in the nursery business and grew ornamentals, but we always had a vegetable garden growing up. My brother, when he was right out of high school, had a summer job farming with a friend of the family. Then my parents bought this place in Healdsburg and he moved there. I was almost done with college, getting a masters degree in freshwater ecology and fisheries at Humboldt State. We were down at the river one day, and we thought we could farm this piece of land. So I finished school and we just sort of started. We both did everything on the farm. Now I do the food processing, the greenhouse work, and the markets. What do you love about farming? Once you get started farming, there’s always something that needs to be done, so there isn’t really a convenient time to quit! I enjoy almost everything. You can be your own boss and do what you want to do. I wouldn’t have chosen anything else. And it’s spectacularly beautiful here at the greenhouse. The swallows are flying around. We’ve got puppies. I just let the sheep out, and there are going to be lambs soon. What advice do you have for new farmers? You’ve got to grow based on what people are interested in and what grows well enough to be profitable. We’ve always grown a lot variety because we grow for the farmers market, our farm stand, and CSA. And the big thing is that there’s always the future to prepare for and to look forward to. Every season is different, and if you want to improve on things, you need to plan a year ahead. Also, you have to be flexible! Often you have to change your plans, because of something weather related or something else happens on the farm. Helen Atthowe has been involved with farming for most of her life. She currently co-manages Woodleaf Farm, an ecologically diverse farm known for its peaches, in Oroville with Carl Rosato. With a passion for Permaculture and no-till farming, she also teaches and consults with other farms about sustainable farming design. How did you get started farming? I grew up in Montana partially on a ranch, so I was driving tractors by the time I was 10 years old. I went off to college to pursue a pre-law degree, but after a year, I decided I really wanted to work outside, so I got my undergrad and grad degrees in horticulture. I was a horticulture extension agent for 15 years and started an organic vegetable and fruit farm with my ex-husband. Later, I met Carl Rosato at an EcoFarm Conference where we were both presenting. Eventually I sold my farm and moved to California in 2012 to join Carl. One of the reasons I was willing to sell my farm and move is that Carl was the only farmer I had ever met who had a remarkably similar farming philosophy to mine. We both try to mimic nature when we design farming systems. We focus on reduced tillage, or no tillage if possible, and creating habitat for beneficial organisms. We try to grow our own fertilizer by using living mulches. We both have the philosophy to watch nature, and that less is best. What do you love about farming? I love the fact that, after more than 24 years doing this, I still find something new to learn every week. I always have the chance to change the ways I have been doing things and creatively design systems to become more sustainable, like managing insects and diseases, like thinking about nitrogen cycling and how to fertilize with less off-farm inputs. What advice do you have for new farmers? My advice would be to keep an open mind, take in as much as you can from other successful farmers’ experiences, and read and listen to everything. I think it’s important to learn from the past but also be creative in thinking about new ways of tweaking farm systems and marketing so that we can find new opportunities. Hear from more women farmers on Monday, March 30, at Yes She Can: The Rise of Women in Agriculture. Moira Firmin with Jesse Kuhn photo by Jenn Heflin. How Will We Grow New Farmers?